6:00 PM - 9:30 PM Next Day3330 Grove Ave. Rabbi Sharon Brous is a leading voice in reanimating religious life in America, working to develop a spiritual roadmap for soulful, multi-faith justice work in Los Angeles and around the country. 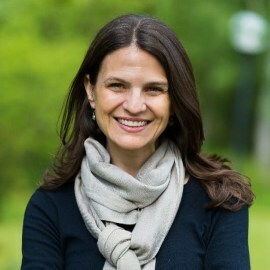 She is the senior and founding rabbi of IKAR (Hebrew for “essence”), which was started in 2004 and has become a model for Jewish revitalization in the US and beyond. With the goal of reinvigorating Jewish practice and inspiring people of faith to reclaim a moral and prophetic voice, IKAR quickly became one of the fastest growing and most influential Jewish congregations in the country. Today it is credited with sparking a rethinking of religious life in a time of unprecedented disaffection and declining affiliation. Read more here. Sponsorships available! You may donate online here OR Contact Faith Kallman at f.kallman@bethelrichmond.org or 804-355-3564 ext. 104. What would it take to reclaim a soulful, purposeful, inclusive vision of religious life? It has more to do with grace, hope and love than you might think. Followed by a Dinner and discussion of Rabbi Brous D'var Torah: Reimagining Religion. To RSVP, please scroll all the way down. Registration ends at Midnight on Tuesday, January 22. The foundational messages of our family, community and sacred tradition are handed down, one generation to the next, through stories. The Exodus from Egypt, the core narrative of the Jewish people, has been a source of spiritual sustenance through moments of pain and privilege, an eternal reminder of the power of hope and the call to communal responsibility. Life is dialogical. Jewish practice is designed to pull us out of our loneliness and give us back access to the beauty and meaning in life.